The Urban Meyer debacle reminds again how far away integrity is in the NCAA’s big time. Even “The Bishop,” UW’s Chris Petersen, talks about being busted by NCAA at Boise St. In terms of scandal-o-rama, the NCAA is running a distant second to the Trump administration. But since part of the NCAA’s mission includes seeing to the welfare of students, they shouldn’t even be in the “also receiving votes” listing in a top-25 poll of American institutions. The Urban Meyer debacle at Ohio State, where his misdeeds surrounding the misdeeds of an assistant coach, which included domestic violence, pinned the needle on the mendacity meter. OSU’s flaccid punishment of a three-game suspension for Meyer, who had 22 days to work up an apology to DV victim Courtney Smith and still whiffed, affirmed that the idea of honesty and integrity in big-time college sports remains a speck on the horizon. Basketball players at North Carolina last week were suspended between two and four games for re-selling their sneakers made exclusively for them, a foul called nowhere else in American life. And Meyer gets three games for dissembling, prevaricating and shaming himself, the program and the university? Then again, compared to the scandals of fellow Big Ten members Michigan State and Penn State, involving coaches and sexual abuse of athletes in their charge, the Buckeyes figure Meyer’s blithering stagger around the ethical landscape was mere foolishness, so get back in there for the Texas Christian game, Urbs. I wondered what Chris Petersen had to say about the big NCAA picture. Knowing the Huskies football coach wouldn’t address any specifics about another program or coach, I asked him whether running a clean NCAA program borders on the impossible. “I don’t think it seems like it borders on the impossible,” he said Sunday at his season-opening presser ahead of the magnum game Saturday in Atlanta against SEC powerhouse Auburn. “In my experience, our players have been good, really good. We spend a lot of time educating them, talking about it. It’s a little bit about what you emphasize, in life and coaching. Nicknamed “The Bishop” by his provocative pal at Washington State, Mike Leach, Petersen had his halo further polished last week. CBS Sports surveyed about a fifth of the 129 FBS coaches for their anonymous responses to questions, including which coach runs the cleanest program. Tied at the top, each getting 17 percent of the vote, were Petersen and David Shaw of Stanford. “Boise State failed to establish an adequate compliance system to report NCAA rules violations with regard to impermissible housing, transportation and other benefits to prospective and enrolled student-athletes. The university failed to provide adequate rules education and training to staff members to ensure compliance. To Petersen’s credit Sunday, he brought up the transgressions himself. “We thought we were doing everything right, and mistakes were made,” he said. “I think there’s a difference between when you make mistakes when you know you’re wrong, and making mistakes when you just didn’t know — even though it’s our job to know what’s right and wrong through compliance. Petersen recently went through another molar-grinder, this time not against the NCAA, but something more important — Nick Saban. The Alabama coach poached LB Ale Kaho after the five-star recruit — Petersen’s highest-rated signee — wheedled out of his letter of intent with Washington, claiming deaths in the family and a divorce between his parents made him not want to be a Husky. Apparently Saban is better at Hallmark sympathy cards than Petersen. In the press conference, Petersen indirectly responded to the Kaho dubiousness. “We don’t want a kid committing to us unless he’s a thousand percent sure where he wants to be,” he said. “There are guys who commit, and (recruiters) still won’t leave him alone, still trying to change him. It’s very, very difficult. Nah. There’s no money in slowing down and reflecting. These are 17-year-olds, all hormones and impulse, and top coaches know exactly how to exploit that, as well as the rules. 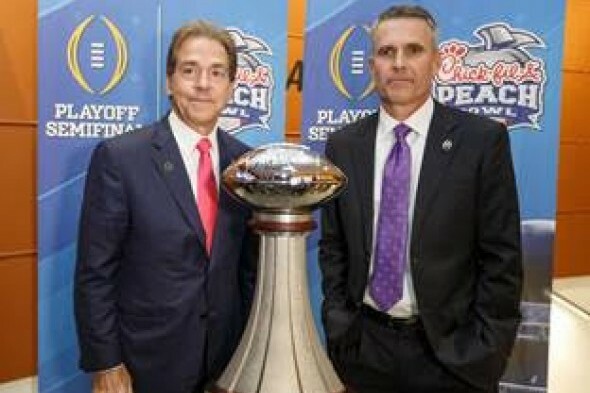 Petersen is a helluva coach, but he’s nowhere near Saban in ruthlessness. Petersen offered mostly a shrug when it came to question of the unmanageable nature of the industry and its absurdly arcane super-morality about amateurism. “I think there’s a lot of things that happen that are out of our control, even though we’re responsible for it,” he said. “There’s 60 people in our building (not counting the 110 football players) we deal with on a daily basis. I think we have one of the smaller crews in college football — from SIDs, to the medical team, to recruiting, to our operations, to our video. I try to keep it tight. I don’t need a bunch of extra people around. “When you have a lot of people, super-competitive, things happen. Human nature is involved. I don’t know if it’s unique to this arena. (College football) is just always in the newspaper. In other words, it was always thus, and so shall it be always. Despite his errors at Boise State, Petersen has elevated Huskies football nearly to the industry pinnacle. Yet if we pay attention, as he instructed, student welfare, and the welfare of people nearby such as Courtney Smith, remain like ethics and honesty — specks on the horizon. Great column but I was left wondering at the end; do you consider Peterson to be as clean as he seems or just a lighter shade of gray? No one is clean in this sport. Some aspire to it; most give lip service. College sports are the most corrupt ongoing institution in America, outside of the Pentagon. Coach Pete has certainly set the standards that he expects out of the football program at UW but he can’t be everywhere all the time. There’s too many moving parts involved. I wonder just how much access to players the alumni have after the PAC-10 handed down sanctions on the program in 1993? And if Coach Pete did any research on how all that went down? I do appreciate that what he’s established is recognized by his peers. Something that had been missing since the James years. Urban Meyer being suspended for what amounts to the Buckeyes exhibition season is ridiculous and nothing more than a means to quell any bad feelings domestic violence groups might have over Meyer’s inaction and it’s failing. Surprisingly the NCAA has been silent on the issue. Six years ago NCAA president Mark Emmert said during the Jerry Sandusky scandal that never again would football be placed before education. What should be happening is a suspension for Meyer pending an investigation or some hard sanctions since the Ohio State football program obviously lacks (wait for it) institutional control since this is so soon after the violations that happened under Jim Tressel. I don’t see how keeping Meyer around can be justified. I wouldn’t be surprised if there will be some domestic violence groups picketing Buckeyes football games. You think Coach James ran a clean program? I seriously doubt his peers would have said so, as they have with Peterson. While you’re looking things up, DB, check out 1993 when the Pac-10 sanctioned James for multiple violations. It’s why he quit. I quit looking for the smoking gun on James. My disappointment in him was that he gave in to Hedges and Gerberding. They threw themselves on a sword that was dubious at best. The misdeeds were real, and deserving of sanction. Gerberding, like all presidents, wanted more control, and didn’t care if he had to go through James to get it. I have a signed copy of John Owens’ book around here somewhere. He disagrees. I’m not naive enough to believe that the James era was perfect ( Or even the Petersen era) but it was never penalized until at the end. Well, it was the penalties that brought about his end as a coach. Well, if Mark Emmert said it, it must be true. Note that Mark was talking about education, not TV revenue. He’s got his priorities straight. I don’t recall the quote but it sounds righteous enough for Emmert. Not to mention foolish. Meyer wins many football games. There is nothing more important, including the task of education, at many big time university programs. In an article about lack of honesty & candor, it’s fitting that you would bring up the Trump administration out of left field, and lable it as the leader in scandals while ignoring dear Bill and Hillary…. -An amusing irony. Once again, the Trumpsters play the “whatabout” game, which apparently makes the vile cesspool that is the current President and his administration acceptable. It is neither amusing, nor ironic. If you were reading me back then, the Clintons were fitting comparatives for doers of bad sports deeds, as are all presidencies. But what-abouters assume without looking it up. Why didn’t Art bring up the Teapot Dome Scandal and Warren G. Harding while he’s at it? Jeebus dude. Hillary lost. She’s in the political wilderness. Bill was president 20 years ago. They have been vanquished. Move on. You mean, move on to the Trump misdeeds? From that Boise State description, it seems like Petersen tripped over NCAA red tape. Better and worse men than he will fall afoul over that. Now, would he be strong enough to stop a domestic abuse scandal like OSU’s from happening? I don’t think he’d be either as oblivious as Paterno was (at best) or as CYA-focused like Meyer, but I hope we won’t have reason to find out. I will say that, after the horrors of Penn State, Baylor and now Ohio State, college football must become far less important to society, never mind sports fans. The rare time I pay attention to it now is if I’m flipping channels on a Saturday and what looks like a good game is on, and after that I don’t even bother following standings or the polls. You are in a small minority of principled people, Kirkland. It’s always been amazing to be how many college football fans hate looking behind the curtain. Or baseball fans for that matter. If Kevin Mather was a politician he’d be out of a job. Yet he remains unscathed as the Mariners team president. Football owners too. How long did Richardson get away with his assaults? In terms of scandal-o-rama, the NCAA is running a distant second to the Trump administration. The very first line in a piece that should be worth reading, but not worth the time if that’s how you lead into it. You couldn’t be more tedious if you tried. Is there something we missed with respect to the Trump administration scandal-o-rama? 16 felonies for Manafort and Cohen, and flips from Pecker and Weisselberg in one week qualify as non-tedious and a non-witch hunt. Robert Mueller is like Tom Brady directing a 90 yard drive. He’s putting the drive together meticulously, play by play, and is currently about 30 yards from the goal line. Manafort is convicted for crimes undertaken years before Trump ever thought of running for president and you tie that to Trump. The guy worked for the campaign for two months but guys like you are so brain dead and me-tooish that you just have to throw in your 2 cents which is more than your comment is worth. Get a brain and take a squint at some of the most egregious scandals ever undertaken by any president, brought to you by the seamy obama regime. The press covered for him so continuously that it was easy for people like you to pretend he has clean hands., History will reveal the truth of what he was really doing right in front of everyone while people of your political naivete are utterly blind to it..
Lightninbug…..You can remain obedient to Dear Leader. However, the following are no longer obedient. They have all either pled guilty, have been found guilty, and/or are cooperating with federal and state investigations: Patten, Manafort (“a good man”), Cohen (who implicated Trump in the payments to Daniels and McDougal, the fixer who knows where all the bodies are buried), Pekker (has a safe full of Trump info), Flynn, Gates, Papadopoulos, van der Zwaan, Pinedo, Weisselberg (the accountant– he knows what’s in Trump’s tax returns, and all about his phony foundation) and now McGahn (30 hours of testimony…that’s gotta hurt). The walls are closing in on David Dennison. Oh, and don’t forget that 13 Russian nationals, 3 Russian companies and 12 Russian intel officers all have been indicted as well. And, there is so much more to come. I’m guessing that Don Junior will be among the charged. Won’t that be exciting? And you speak of Obama? Number of indictments in 8 years = 0. Number of guilty pleas = 0. Number of guilty verdicts = 0. Thank god for Stormy Daniels and Robert Mueller. MAGA = Moscow Agent Governing America MAGA = Mueller Ain’t Going Anywhere MAGA = My Attorney Got Arrested…But, it’s google’s fault. Your are blind to what is going on. Mueller himself is guilty of more crimes than people like you will ever admit, and the FBI/DOJ is rife with common criminality, and crimes against the State. Believe me when I say, you will not be having the last laugh. If you have anymore to say to me, I will simply BLOCK USER. Your abject submission to the resistance and all they feed you is of no value except to those unable to reason independently. Feel free to regale others with your tripe until they too make you disappear. VOTE IN NOVEMBER. Won’t it be wonderful if the House of Representatives is Deep Blue in January? But you keep showing up, rosetta. And Team Trump keeps out-scandalizing college sports. That’s sumpin’, pal. Thank you, Art, for an important piece. What my forefathers would think of all of these transgressions! As they taught me how to bleed purple and gold, they would be quite thankful to have the UW program in the hands of Chris Petersen, as they were with Don James. With all of the moving pieces for each program, which includes extremely loyal boosters, a.k.a. greased piglets, it’s always been a crap shoot for the institutions to keep totally clean. It’s almost like “strap in and hope for the best” for decent AD’s and coaches. However, there is no hope at all if the program leaders don’t exude the proper values at all times. Obviously, that is the case at Ohio State. OSU must have been covering their eyes and ears when the President of University of Maryland spoke about legal and moral responsibility for Jordan McNair’s death. As for Washington, show me where Chris Petersen hasn’t exuded the proper values. With his core values and example, along with the program dismissals of student athletes that did not conform to those values, he has the best chance of succeeding in keeping his program clean. It was a long time ago when Don James ran the program, and that was when much of the NCAA rules were new, poorly communicated, poorly regulated, with very few, if at all, tools in place to control. However, EVERY example of Don James that I’ve ever read, heard or witnessed was just as pristine as Coach Petersen. Don James was a man of great values and integrity, and I would question the basis of any argument otherwise – why would anyone even bother going there? Well, perhaps they would go there because he was sanctioned in 1993 by the Pac-10 for multiple rules violations, and quit over the punishment. James had high values, but one of them was winning, and he had to keep up with others who were also violating the rules. The NCAA is set up to force cheating by everyone because it prohibits payments to athletes for their labors. It’s wrong, and makes fools of us all.